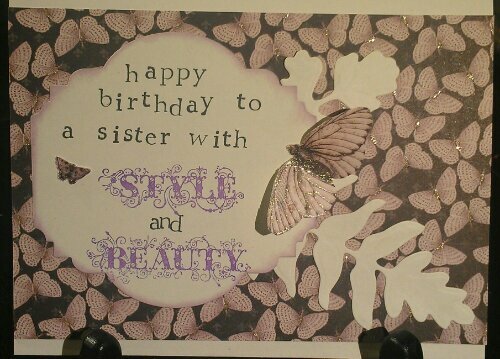 This is the card that I am making for my Fiance for his 27th Birthday . He has more than been hinting lately that he wants to go camping. I love camping, but it’s just a schedule issue why we haven’t gone lately. You see, a person needs free time to go camping and that is something I have none of lately! I did, however, make sure to put aside a little bit of time to make him a Birthday Card. This card is not yet finished. I need to do the inside, but I am just to excited to wait to share it! The inside is going to say “let’s go on an adventure”. The adventure being camping. The weekend of his Birthday, I have nothing that I need to do because I am going to make sure to get it done during the week. 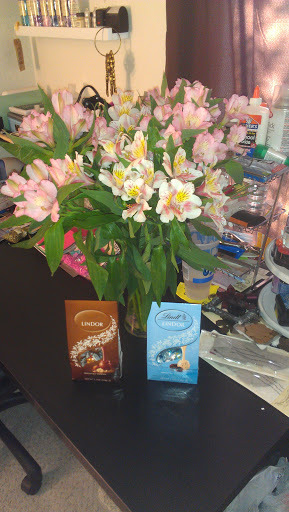 So , when he opens the card, I will tell him we can leave that weekend if he wants to. I will share the card again when it’s completed, but I just had to show it so far! By the way, the tree that I used is actually the Love Hearts Tree that I made. I just snapped off a few branches to make it more manly. Pretty cool, huh? If you want to purchase the tree, just click right here. It’s $4.95 and made of THICK 1/8″ wood , but the branches snap off easily since they are a thin cut. It adds a ton of dimension. I used a wood-grain stamp and inked the edges to make it look like it belongs. The tree is actually pretty large, but this card is huge so it kind of dwarfs the largeness of the tree. I will post the exact dimensions when it is finished, but I believe it’s at least 8″ wide. That’s it for now. Thank you for peeking! I just finished making this birthday Card for my boyfriend. I’m really happy with how it came out and I’m very excited to give it to him next week! Here are some pictures. I’m not going to get into the techniques too much, but if you want to know how I did something better, just ask in the comments and I’ll be very happy to answer you ! I cut this out using my new eclips machine. I made this using ecal software. I cut it out on white 65lb cardstock . I dabbed distress inks on my craft sheet and spritzed them with a mini mister. I blotted up the ink onto the die cut shape. I wanted it to match the patterned cardstock one that I also cut with my eclips. That shape and the grungepaper shape were cut using some free files I got from http://www.svgcuts.com . I also used distress inks to make my grungepaper match by just swiping them directly onto the grungepaper and patting it on the ink pads too. 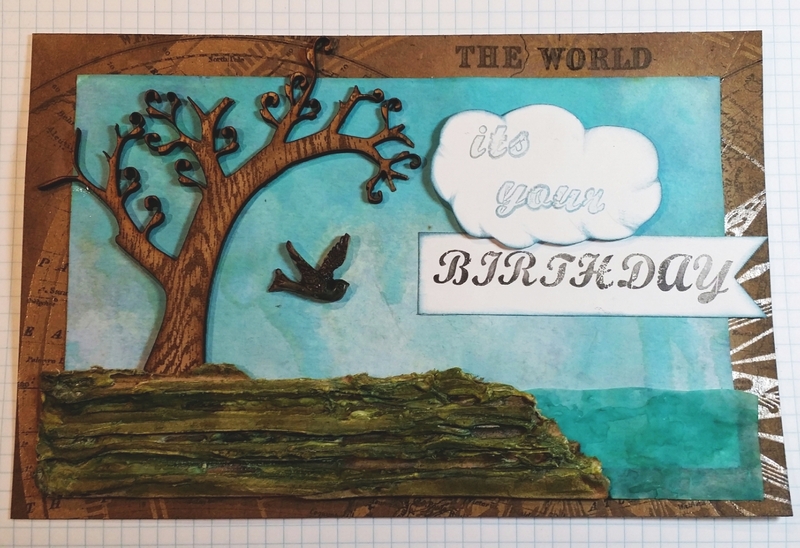 At that point I put my top shape onto the patterned cardstock and noticed the colors were too close, so I added a darker blue to the happy Birthday saying . Using an ATG gun I attached the two together . I used dimensional adhesive to add the top saying . I then cut a piece of lightweight chipboard to 12″ x 6″ and scored at 6″. I distressed the edges with a tonic paper distressing tool. I painted the front with vintage white acrylic paint, not worrying about having full coverage . This was good enough since I am adding inks . I picked a couple different colors (actually 4 I think) of distress inks and started swiping the ink pad onto the chipboard . Next I added ribbon by measuring the middle of the card and cutting a slit to feed it through. After gluing the ribbon down, I pierced holes in all of the pointed corners of the frame. I put brads through the pierced holes to hold everything down. This is what the inside looked like after, so I knew I’d need to add something to cover that . 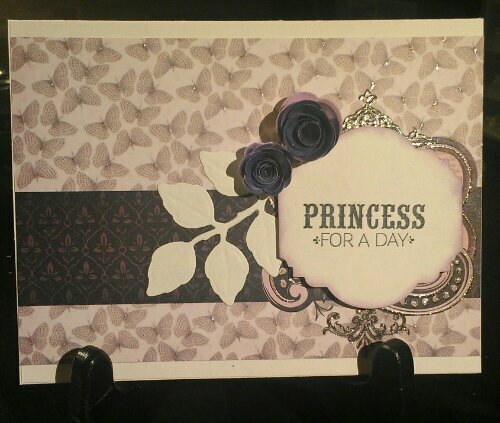 I adhered some of the same patterned cardstock that I used on the front onto the inside of the card . I also used a distress ink around the edges. I cut out a piece of white cardstock, used the paper distressing tool on the edges and used a small sponge wedge with forest moss distress ink. I stamped this bike from a Tim Holtz stamp set using Archival Ink . The back of the card has a quote from a Tim Holtz stamp set and a stamp I had custom made . I’m going to write my own message on the inside, but liked that quote, so I added it to the back.